Wednesday night the Planning Commission approved a draft development agreement (DA) to allow the developer Hines to tear down the old 203,000 square foot Papermate factory on Olympic and build a 767,000 square foot office and residential project. This vote represented good work by the four commissioners who voted for the project and by the three who voted against it. Last week’s hearing was the commission’s fifth on the Papermate project. I have heard people say that this was excessive, but it wasn’t for a project of this magnitude. I don’t remember exactly how many hearings the Planning Commission, when I was on it in the ’90s, held on the St. John’s Hospital DA, but there were many and we even had the City hire an architect to give us a second opinion about some aspect of it. It’s reasonable for the commission (and staff) to spend this kind of time on a big project — I bet that on a per-square foot basis it’s not so many minutes. Why do I say that both the commissioners who voted for the project and those who voted against it did good work? To begin with, the entire commission worked to improve the project and achieved improvements that even the developer acknowledged. When the project goes before the Architectural Review Board, it can benefit from input there, too. As for the four commissioners who voted in favor, in a difficult political climate they did the responsible thing and voted for a project that the city must have. 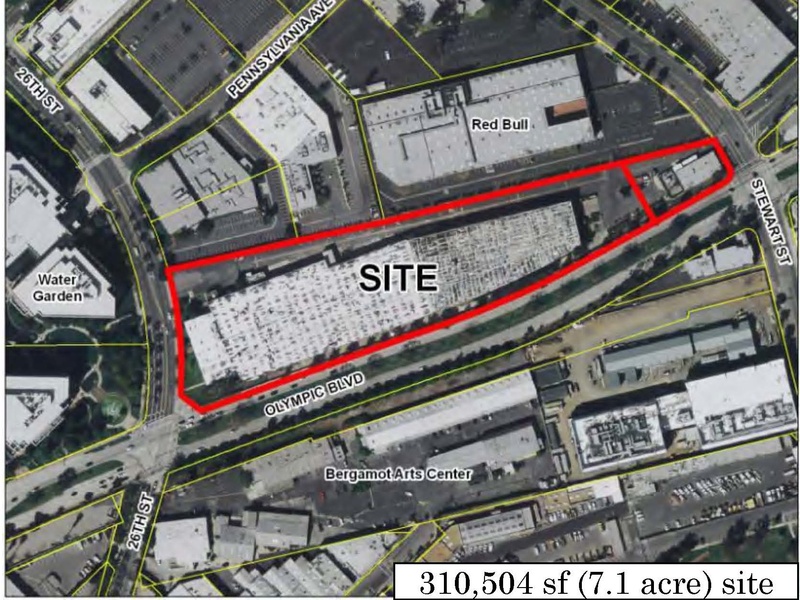 It would be disastrous for the Bergamot Expo line station to have to face the massive bulk of the Papermate factory, sitting as it is on a 310,000 square foot superblock. The Papermate site is the key site for the connection of the whole Bergamot plan area to the light rail. This has been acknowledged at previous hearings before the commission and before City Council. It was interesting that Wednesday it was Commissioner Richard McKinnon, one of the three commissioners who ultimately voted against the project, who made this point most forcefully. McKinnon pointed out that the worst result would be that Hines would simply turn the factory into offices. If you don’t think this would happen, consider that this is what Red Bull did with another big industrial building next to Papermate. If Hines did that, we would get all the traffic of office development, with none of the residential development and new streets the area needs, and without any of the traffic mitigations and other benefits included in the DA. What the four-person majority did was to recognize that the commission had negotiated as much as the commission could negotiate, and it was time to send the project to City Council for final negotiations. As I said, in the current climate, this took courage. But when it comes to those final negotiations, I hope it will be the ideas of the minority who voted against the project that the council will be able to use. But ideals have to take into account circumstances, and the circumstance here, as Commissioner McKinnon and others noted, is that Hines already owns a 203,000 square foot commercial building. Moreover, even under the pre-LUCE zoning, which allowed a floor-to-area-ratio of 1.0, and I suspect now under what’s called a “Tier One” development (not that I pretend to understand the rules), Hines could add a mezzanine with about 100,000 more square feet of development inside the existing building. This would give Hines 300,000-plus square feet of office — nearly equal to all of the office development in their current proposal. Commissioner McKinnon’s proposal was to allow Hines to build 233,000 square feet of office, plus about 30,000 square feet of retail; this would mean that 142,000 square feet of office in the plan would be converted into more housing. His motion failed on a 4-3 vote, but I don’t know if this position was ever taken up in negotiations with Hines. I hope that planning staff (and Hines) look into something like McKinnon’s proposal before taking the DA to City Council, and, if they don’t, I hope that the council members insist they do so. But I would rephrase and remake McKinnon’s proposal slightly, for the purpose of making a deal. What seems fair is to allow Hines the 310,000 square feet of commercial development they would have under the pre-LUCE zoning (about 45,000 square feet more than what McKinnon was proposing). The rest of the project would be residential: a net change of about 100,000 square feet from commercial to residential. Not so long ago, when the office market was stronger than the residential market, I can imagine that this would have been a deal-breaker for Hines, but I would hope that it wouldn’t be one now, given that the residential market, both for rentals and condos, is now so strong. A lot of people (including myself! ), observing the morning and afternoon gridlock generated by commuters coming into the Bergamot area, wonder how it’s possible to consider any more office development there. But the fact is — 203,000 square feet already exist on the Papermate site. I know it’s cold consolation, but 300,000 square feet of offices is not a lot when compared to the many millions of square feet already in existence in Santa Monica and West L.A., and the location across the street from the Expo line is the best place for the development. This entry was posted in Uncategorized and tagged Papermate development, Santa Monica development by Frank Gruber. Bookmark the permalink.